A fractured fibula sent Denver Broncos center Matt Paradis to the Injured Reserve 569 offensive snaps into what was a strong start to his 2018 campaign, but the injury didn’t keep the Carolina Panthers from betting on the four-year veteran returning to form when healthy. Per ESPN’s Adam Schefter, Carolina intends to sign 29-year-old Paradis to a three-year, $27 million deal when the new league year begins. Paradis is expected to take over for Panthers legend Ryan Kalil, who retired shortly after the 2018 season. 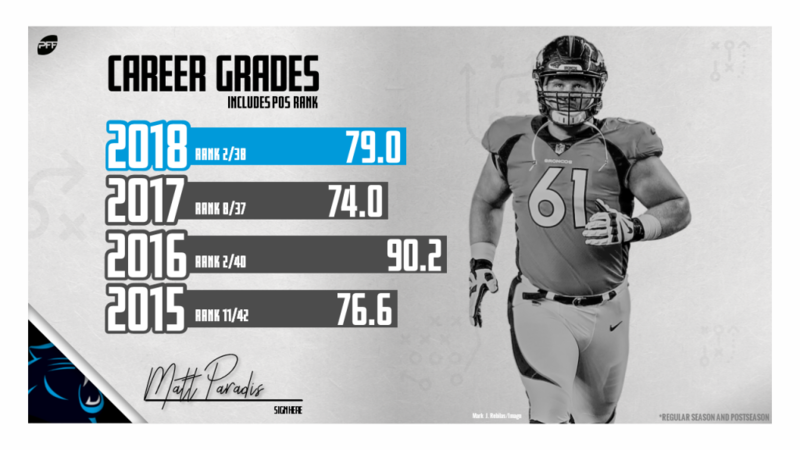 Including his injury-plagued 2018 season, Paradis has earned 74.0-plus overall grades in all four years he’s played in the NFL. He also earned a career-best 90.2 overall grade in 2016, which was largely propped up by his 90.0 run-blocking grade that season. Paradis’ four-year grade (86.7) ranks fourth among the 29 centers with 2,000 or more snaps in the NFL since 2015. Only Travis Frederick (91.7), Alex Mack (91.7) and Jason Kelce (91.1) rank ahead of him in overall grade. Paradis also ranks fourth in run-blocking grade (85.0) and 10th in pass-blocking grade (82.3) on the list. Looking at how his pass protection has improved in the last two years, Paradis’ 98.7 pass-blocking efficiency and 2.4% pressure allowed rank sixth and tied-for-sixth, respectively, among the 29 centers with 1,000 pass-blocking snaps in the last three years. A healthy Paradis is well worth the $9 million Carolina will throw his way on average per year, especially considering his high-floor production and 2016 ceiling.